Above: This 1795 map shows Stonyway Gate lying on the first turnpike between Buxton and Macclesfield, which was completed in 1759. The second turnpike was opened in 1823, and crossed the old route at the same spot. After tracking down the milestone between the Cat & Fiddle and Peak View Cafe (see previous post), I tried to find evidence of the nearby toll booth known as Stonyway Gate. This was one of five gates across the first Buxton to Macclesfield turnpike where travellers were forced to pay a small tax. The amount depending on how they were travelling: by foot, on horse, in a horse and cart, or a horse-drawn carriage. Costs also varied depending on the number of farm animals being driven through, the size of the wagons, or by how many horses pulled the carriages. The money collected was used to pay back the trusts that built the roads, and to keep them properly maintained. 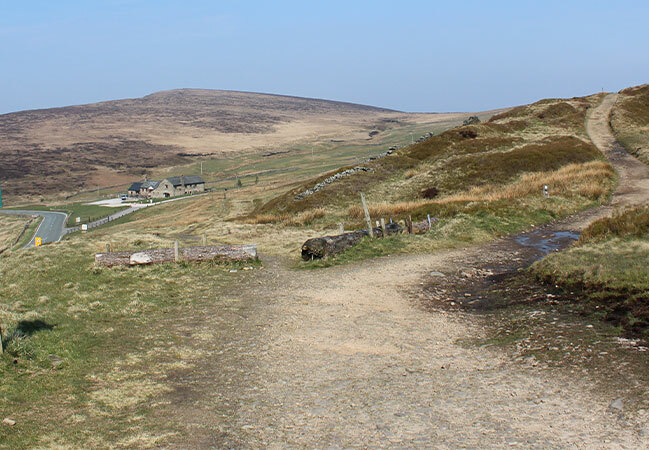 Above: Going along the route of the first turnpike towards Macclesfield (the track to Shining Tor is on the right). There is a flat area on the right, just beyond the two logs (click to enlarge). Was this the site of the toll booth, or was it where the cafe sits today? Or was it moved from one spot to the other when the new turnpike was opened? Stonyway Bar may have been moved at some time. The plan deposited in 1819 appears to show it on the right hand side of the original route, going towards Macclesfield, as one descends the hill, between the original route and the proposed new one. There is an open space that could be its former site at this point. 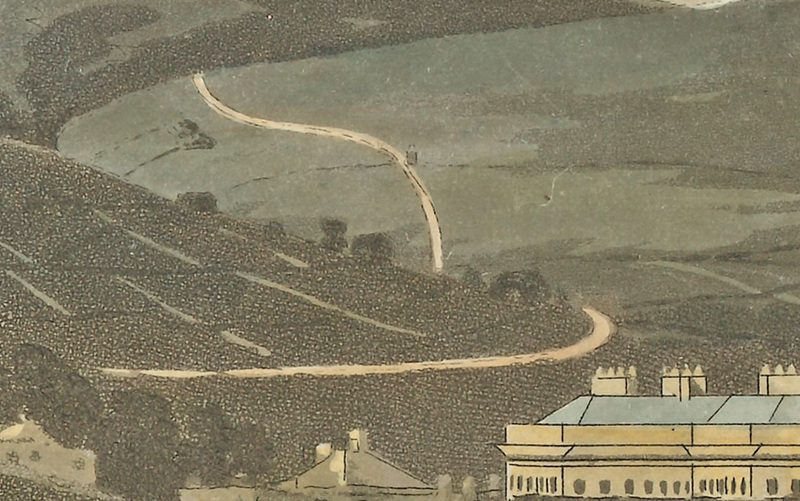 The Ordnance Survey map, on the other hand, shows it on the site now occupied by the Shining Tor Restaurant*, where it would have been better placed to cover the New Road. The fade shows the area today. I have to admit that I’m not sure what Alan means by the ‘open space’. So I’ve asked if he could explain a bit further. And also help me locate the 1819 plan he mentions. The image shows part of a map which was published in 1795 in ‘A Description of the Country from Thirty to Forty Miles Round Manchester’ written by John Aikin. This large folding map has no engraver’s signature, but is usually attributed to John Cary. Its scale offers more detail of the Goyt Valley area than most others, and although it does not specifically detail toll booths, it does mark the hamlets of Stonyway Gate and Walker Barn on the A537 where there were toll booths. The Macclesfield-Buxton Turnpike Trust; Act of Parliament 1759 had six main and one side booths, and left Buxton via Burbage (toll booth near Burbage Church), and shortly afterwards at Gosling, close to the modern Goslin Bar Farm. It initially followed a more northerly route than the modern A537, joining this somewhere near the toll booth at Stonygate. There was a later toll booth at Walker Barn Bar (on the modern A537) just before entering Macclesfield. There were other toll booths at Black Road Bar, Broken Cross and Ollerton, though I haven’t been able to place these on any map. In 1821 this toll road was re-routed, probably to the south, (closer to the A537). There may also have been a toll booth called Moss Chain somewhere near the junction of the A537 and A54, though I am not sure which of these two roads it serviced. I’ll update this page if I manage to discover any more information. In the meantime, if anyone has a better idea of where Stonyway Toll Booth once stood, please do get in touch. Quick links: Click here for more on the turnpikes that passed close to the Goyt Valley. And here for a chapter in Alan’s book where he describes the end of these unpopular taxes.